The Seattle Electric Company's Georgetown Steam Plant exemplifies America's acceptance of, then reliance upon, electricity. After Thomas Edison introduced this new form of power in New York in 1882, electricity quickly moved from a simple curiosity to a "requirement" for civilized living. The 1906 Georgetown Steam Plant, a National Historic Landmark, represents important developments in the early history of both electricity and engineering in the United States. The plant houses one of the last operable examples of the large-scale General Electric steam turbines that doubled efficiency and ushered in the "modern" era of electricity production. Patented in 1896, the new turbines reached the market in 1903 and within 15 months their number surpassed that of all other steam turbines combined. The Georgetown Plant is significant as a marker of first generation General Electric turbines when the two turbines were still arranged vertically, by 1908 the turbines sat next to each other because this horizontal arrangement significantly improved production. 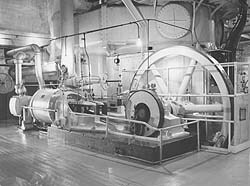 Continued developments in electricity and engineering led to the addition of another turbine in 1919. Although the new addition was smaller than either of the older units, it roughly doubled the output of the plant. The Georgetown Steam Plant is also an early example of reinforced concrete construction, one whose design combines very subdued Neo-Classical stylistic elements with the practical needs of an industrial building. 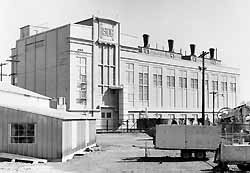 Seattle Electric Company constructed this new power plant so that they could provide power during "peak demand" because consumers quickly became heavily reliant on electricity and were intolerant of power failures. This new power plant, along with exclusive operation of the street railway system, gave the Seattle Electric Company an advantage in the intense competition with other local power companies. The Georgetown Steam Plant discontinued service in 1972, but it still illustrates the history of electricity's expansion into the everyday lives of Americans. The Seattle Electric Company Georgetown Steam Plant, a National Historic Landmark, is located at the intersection of S Warsaw Street and Ellis Avenue S. just North of the King County International Airport. It is open to the public on the second Saturday of the month, 10 a.m. to 2 p..m.. For more information about visiting the Georgetown Steam Plant or general inquiries, please call 206-763-2542 or visit the Georgetown Steam Plant website.